Yesterday, Paris Saint-Germain officially completed the signing of Brazilian superstar Neymar from Barcelona and in the process more than doubled the previous world transfer record after triggering the 25-year-old's enormous €222m release clause. But Barcelona doesn't seem happy with loosing their star player and they have just issued a communiqué on Neymar's transfer. 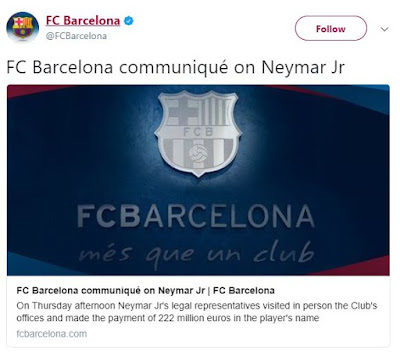 The communiqué reads, 'On Thursday afternoon Neymar Jr's legal representatives visited in person the Club's offices and made the payment of 222 million euros in the player's name with regards to the unilateral termination of the contract that united both parties. As such, the Club will pass on to UEFA the details of the above operation so that they can determine the disciplinary responsibilities that may arise from this case'.